Do you miss those days when you had to bring a book on a flight to read and relax and forget about the world even if for a couple hours? This almost never happens anymore with the in-flight WiFi. You get on a plane and jump right back into the mailbox to stay connected. To put it simple, there are two ways Internet signal can reach you at the height of 35,000 feet. First is using the broadband towers sending the powerful signals to the aircraft antennas (usually located on the fuselage base — the belly of a plane). As the aircraft moves, it automatically reconnects to the nearest tower on Earth. However if you are travelling over remote terrain for too long, there can be a lack of connectivity. Second way of getting WiFi on planes is using satellite technology. Aircraft connects to satellites in geostationary orbit (35,786km high), and they transmit signals to Earth via receivers and transmitters. These satellites are the same used in TV, weather forecasting, and secret military operations. Data is transmitted via an antenna that is located on the top of an aircraft and connects to the closest satellite. The Internet signal is distributed among the passengers with a router located on board. With both methods, US air companies have a better developed infrastructure than carriers in other countries. Subsequently the US carriers offer a better and often cheaper WiFi on plane than European carriers. Why is in-flight WiFi slow? Although technology is developing at an impressive pace, it has still to catch up with the number of devices on board that are desperate to connect to the Internet. When an in-flight broadband company Gogo (previously known as Aircell) launched its first WiFi service in 2008, the 3 Mbps speed was just enough for several computers on board (video streaming was blocked). However now that it's getting so popular every passenger will connect at least one device to the network. A satellite connection will offer around 12 Mbps, which is much better, however very expensive and high-maintenance. If an even WiFi signal needs to be distributed on board of a plane, one can use the NetSpot app for a detailed coverage analysis and correct placement of access points in the aircraft. What makes in-flight WiFi so expensive? Naturally all the advanced technologies with such high-maintenance equipment don't come cheap, especially if you add an aircraft to the equation. Antennas also increase drag, adding fuel costs to the airline’s bill. Every little expense, including maintenance and engineering will reflect on the end customer. 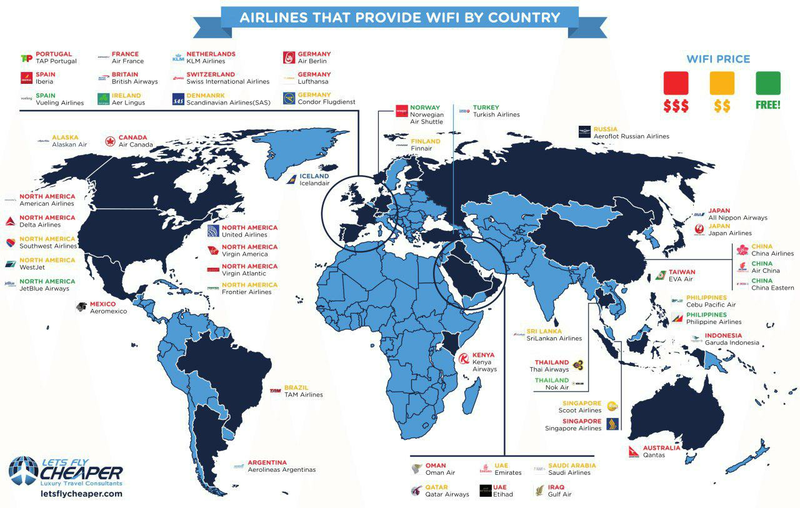 The price on in-flight connectivity can vary from company to company, and free inflight WiFi trial is usually offered by a handful of airlines. Make sure to check the restrictions these free WiFi services come with: some will only be available for laptops and tablets, some will only be offered on domestic flights. Provider: ROKKi wifi service allows passengers to use ROKKi chats to send text messages over Whatsapp, WeChat and LINE. Price: €4.90 for 30 min/20MB; €8.90 60 min/50MB; €13.90 duration of entire med-haul flight/90MB; €18.90 full flight package (long-haul flights)/120MB data. Price: Free (but not allowed on smartphones). Provider: Delta Connect & Gogo. Delta will be providing Gogo’s new 2ku satellite service on long haul domestic flights and in 2016, for all long haul fleets. Price: 10MB free in all classes on A380 aircraft. 500MB available for purchase starting at USD 1 on select A380 and B777 aircraft that do not offer free wifi. Price: Aboard B777-300ER — Executive Class & Economy Class passengers: $11.95 1 hour unlimited browsing or $21.95 for an unlimited 24-hours. First Class passengers: free. Aboard Airbus 330-200/300 — Executive Class & Economy Class passengers: mobile $2.49/$9.95 (3MB/10MB); laptop $9.95/$21.95 (10MB/25MB). First Class passengers: free. Price: Smartphones and tablets: 4MB for $4.95 or 22MB for $19.95. iPad: 22MB for $19.95 or 50MB for $39.95. Price: Economy class: Exact pricing TBA. Saga Class passengers and Saga Gold members: Free. Price: 4 packages that range from 30 mins (USD 6.95), 1 hour (USD 11.95), 3 hours (USD 16.95) and 12 hours (USD 21.95). You can use a credit card to purchase in the portal. Price: Prices depends on the passenger’s network provider’s international roaming charges. Price: SAS Go passengers: €8 (within Nordic countries) €12 within Europe. SAS Plus & EuroBonus members: Free. Price: THAI Sky Connect Smartphone users: $4.50/146 baht for 3 megabytes or $14.50 for 10 MB; Laptop or tablet users: $14.50 for 10 MB and $28.50 for 20 MB. Business Class passengers: Free 3-month trial. Price: Unlimited access on United flights $17. Gogo Unlimited $49.95/month (unlimited internet on all Gogo equipped airlines); Gogo All Day Pass $14 (24 hours of internet access on the same airline); 1-Hour Pass $5 (internet access on any single domestic Gogo equipped flight); The Traveler Pass $39.95 (monthly subscription for unlimited internet on one Gogo equipped airline). Price: TBD. Estimated at $15—$20 on international flights and possibly free on domestic.